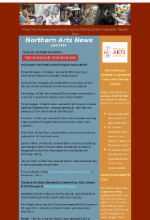 Start your Summer Right– Read Northern Arts News! ….and many more summer arts events and opportunities in Region 2! Previous postRead Northern Arts News for May Events, Opportunities, Workshops, and More! Next postGreat Art Around Town Starts Today!